I like long drives. Sometimes these long drives are clueless drives with no defined destination. Back in the days of the Nano, we used to keep ourselves entertained by singing songs – Kishan and I. Nano never had a music system in it because I didn’t want to spend money on a car which I knew would eventually get replaced. Now that the car is gone and because Kishan is a good co-driver only till he feels sleepy, I decided to give Ananya some singing abilities. I took her to an audio clinic the day after she was delivered to me. Roshan Ali, a young and energetic guy (roughly my age), suggested that I should go for a Pioneer system. Pioneer is supposed to be ruf-n-tuf. Or, maybe, he just gets better commission selling them? I don’t know. He was the audio doctor I went to, and I decided to follow his prescription. As I turned the pages of the Pioneer brochure, I started to grow more and more concerned about the model I should be choosing. And these concerns were genuine as most Thar owners would have experienced such a situation at some point in time. Ananya wears a soft top. That means anyone with a knife-like object can walk into the car (yeah I know it’s a jeep), without triggering any alarms. A skilful thief who has been in the stealing business for sometime can remove the audio console im ten minutes. So I had to go for something that isn’t expensive (read no bluetooth, no touchscreen, no GPS). 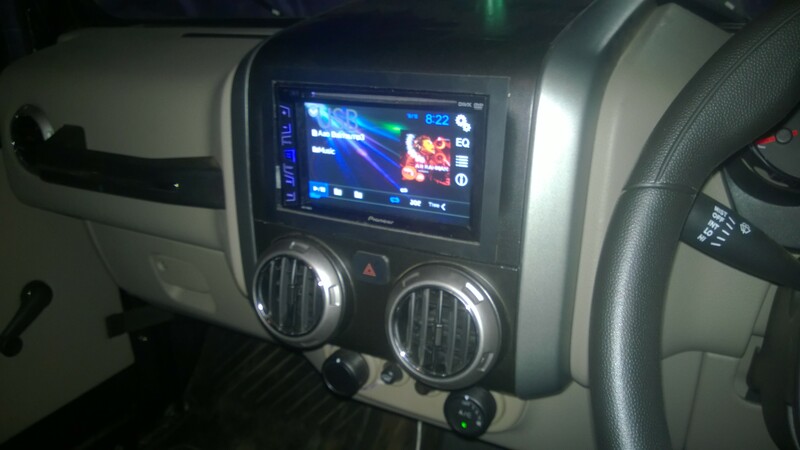 Mahindra has provided a place for a 2-DIN console. When you remove the good-looking “Thar” cover from the dashboard, you will realize that the only way to get a nice job done without meddling with the dashboard would be to fix a 2-din console. The cover has guiding ridges to knife the center portion out. Given that the cover is made of hard plastic, it isn’t an easy job to cut it. Also, there’s no easy way to fit a 1-din system there. So I had to go for something that isn’t expensive and yet is a 2-DIN. There was a model which essentially was a 1-DIN, but, it’s size was that of a typical 2-DIN system. It would cost me 10.5k. The cheapest Pioneer 2-DIN would cost me 15k and it comes with a touchscreen and a remote too. I decided to go for the latter. As far as the speakers are concerned, I had chosen 400W JBL coaxial speakers. However, Roshan suggested that I can opt for 360W Infinity speakers for the same price. At 4.8k, the Infinity are actually amazing. The lows, highs and mids are all fabulous. I have taken Ananya on two long drives after installing the music system. I am happy that we were able hear the most effects even at 120kph – a speed at which the soft top flaps very loudly. It took around 2 hours for the entire job to be finished. On my request, Roshan clipped the wires and attached “clip-on”s so that I can detach the speakers when I want. I didn’t want to drill holes into the chassis and fix the speakers. The only drawback is that the console doesn’t appear like it’s an OEM fit. The dashboard design leaves gaps between itself and the console’s border sticker. Considering that now a battle-tank can actually sing, I can live with such quirks. 14 days after I got this job done, I felt that the job done by Roshan was good but not brilliant. Why? He had left the wires under the mats and I too thought that there was no provision in the body to hold the wires. However, when I took off the mat on the co-driver’s side, I could see wires running into the bodywork. This discovery surely saved me some insulation tapes and leftover gum on the body. Sometimes I miss the surround-sound effects. But, I’m still contemplating whether to install component speakers in the front doors or not. May be I’ll get that done next year or maybe never.